After having had the pleasure of reviewing a game from SimplyFun during the 2015 year, I was thrilled to be selected to try another of their games out this year. 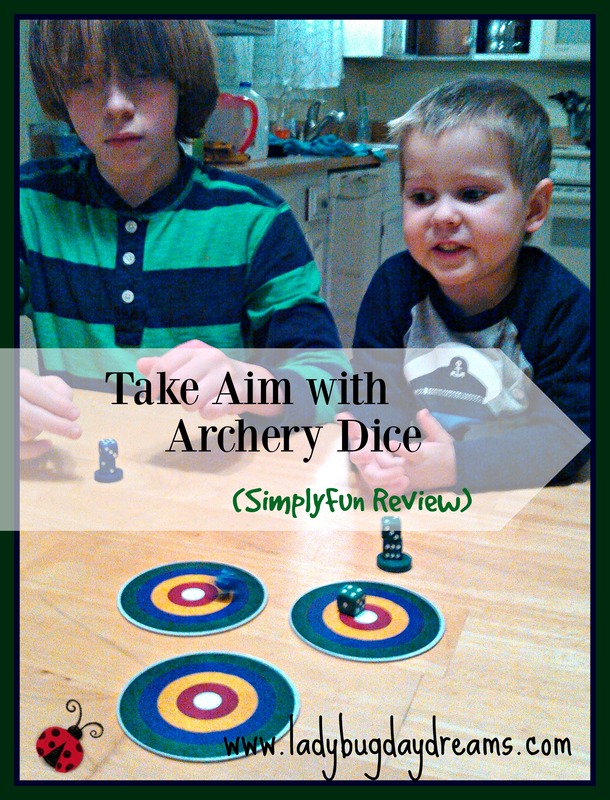 I’m reviewing Archery Dice, one of four new releases from SimplyFun. My kids are really into the Middle Ages, so it was neat that both of the games we had to choose from had that time period as their basis. After looking at the website, we (the kids and I) decided that Archery Dice would be more up our alley, so that’s what we applied for (and received). The recommended age for Archery Dice is 7 and up, but Small Fry (age 3) was able to play with us just fine. Inside the box were 12 dice (three each of four colors), four wooden discs upon which to stack your dice, and 16 heavy duty cardboard targets, along with the rules booklet. The rules of Archery Dice are quite simple. Set the targets out on the table, stack your dice into a stack, and flick them – one at a time – onto the targets. If your die alone is on the target at the end of a round (defined as when all 3 dice from each player have been flicked), you win it. If your opponent also has a die on the target, whoever has the highest number showing wins it. Keep the targets in front of you for one more round – this gives your challengers a chance to steal the target (which they can do by flicking one of their dice onto your target during the next round). If they fail, you get to “bank” the target at the end of the round. Once a target is banked, it’s safe from theft. The first person to bank four targets is the winner. SimplyFun games are more than just games; they all have a goal of teaching children through play. Archery Dice teaches kids control over their movements (by how hard they flick the dice), how to aim (by where they flick the dice), and strategy (is it better to try for a new target or to try to steal your opponent’s?). I like this about the company. Games for the sake of playing are great, but if you can teach your children at the same time, that’s even better – especially if they don’t realize they’re learning. The first time we played the game, it was the kids (Seahawk, Munchkin, and Small Fry) and me. We read through the rules together and then just played. I like that there’s very little setup with this game. Give each person a stack of dice and a wooden disc, set the targets out, and you’re ready to play. It’s really convenient not to have to deal with a game board and a lot of little pieces. And because the game is so simple (flicking dice), even small children can play, with help. 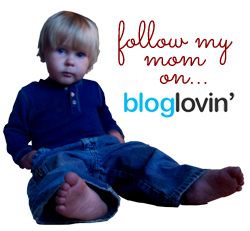 Small Fry is only 3, but he was able to successfully play this game. He even banked a target or two. Overall, we really enjoyed playing Archery Dice. It was fun; we laughed a lot during play and had a great time with the game. We’re fortunate to be able to add this game to our arsenal. 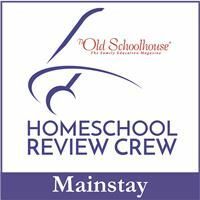 More reviews can be found on the Schoolhouse Review Crew Blog.